In October of 1962, on the 14th day I turned 12 years old. On October 15, 1962 images of medium-range and intermediate-range ballistic nuclear missiles, under construction in Cuba, were presented to President John F Kennedy, and the 13-day crisis began. I was in sixth grade at Highland Elementary School in Lake Worth Florida. I remember sitting in our Florida room with my mom and my sister listening to the President and being scared to death. I remember my aunts calling my mother to see if she was going to drive back to New Jersey to get out of danger – you see, everyone was convinced that South Florida would be the target of these missiles. Back in those days we read the Bible in school and we prayed! Each morning a sixth grader would go to the Principal’s office and over the loudspeaker would lead the entire school in a meditation, a prayer, and the Pledge of Allegiance. By some divine appointment, it was my week to do this. I armed myself with Matthew 24. And I prayed a prayer, a simple sixth-grader’s prayer, that we would be brave and courageous and that God would protect the United States of America. We were and He did. Today, we have another kind of war raging – angry people walking into public places and shooting innocents. We still have global war threats every single day. 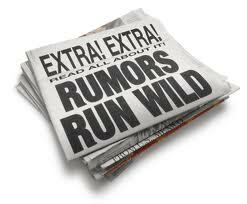 We live in a world racked with troubles, wars, and rumors of wars. I’m not scared to death anymore – I want to be scared to life! To live each day as a gift from the One who assures me to not be frightened or troubled due to wars and rumors of wars, and that these things must take place. I am going to either be taken up to heaven by the rapture of Jesus Christ of His church OR, I am going to die on the day appointed to me. Either way, one way or the other, we are all going to leave this earth. This is not a rumor – this is Truth. I pray you are not scared or troubled. When the extremely famous and BEST selling series came out Left Behind, naturally I wanted to read them, and did. One day my son was here and asked why I was doing that. He told me what an evangelist said, one that he’d known for years and trusted. Rice Brooks (sp?) said, “It wasn’t being left behind he was afraid of. It was “being left out” of the greatest work God would do on earth re: saving souls, etc. I took that particular book back to the library and since then have had no desire to finish the series (and I’m a series nut). Rice was right. It’s more being left out of any and everything God is going to do. My appointed time is in His Sovereign Hands. That’s good enough. What a great blog this morning. I just read it to my husband, Mike, laying next to me here in the bed watching the news. He is in the fight of his life taking Chemo drugs for his Hep C virus. We both know one day the good Lord will take each of us on our “given day” and it gives me calm to know that I know just where I am going. Life is short, make sure you are in tune with God’s word and know that he died to save your soul. Folks would say, “I hope so” when asked if they were going to heaven, I would say, “I know so.” John 3:16 Amen!!! Wow! this is really from Our Abba. just yesterday, I was walking in fear, about something. And here you go, Comfort from our Lord. And you didn’t even know about it. Thank you honey, for your sweet word, in due season. Love ya honey, and Praising Our Lord! Last Sunday our Pastor prayed that we would leave church and “be carriers of hope”. I have been thinking about that all week and as I listen to the news I see no hope for peace in our world, no hope for jobs, no hope that we are safe walking the streets. We live in a world inhabited by hopeless people but we have the God of hope who can fill us “with all joy and peace as we trust in Him, so that we may overflow with hope by the power of the Holy Spirit”. Romans 15:13 The challenge is that our hope might overflow to all of those we encounter. The need is great. Sus…sounds like you handled the “Bay of Pigs” crisis well at a young age. Loved this blog…keep up the good words! Yes Sis I remember that day so clearly. I remember looking out the front of 3132 Buckley Avenue toward the East and wondering if we would actually see the missles coming at us and we could have being so close to the ocean. I remember going to Lake Worth beach and looking out towards Cuba and almost waiting and anticipating. I don’t think I was afraid because I always knew where I was going if that happened! Heaven! Now I look out at the ocean at Lake Worth beach, remember all the promises the Lord has given me, how He is so faithful, and I don’t fear anymore. How true, it is so easy to let fear creep in and then the Lord gives us a word through a friend. There is no joy in fear, and I’m thankful for the Joy of the Lord. Not just the feeling of being happy but real joy in the Lord no matter what happens. Thank you for your encouraging words. I had no idea why the Lord laid this message on me to write down – the Bay of Pigs crisis was a very long time ago…but by the comments I can now see how HE used it to minister against fear. Fear is a bad, bad thing – it is Satan’s favorite weapon (I think). Most every action we take is taken out of love or fear…I heard that quoted the other day and I believe it to be true. Perfect love casts out all fear………we must know who we are IN CHRIST! No weapon formed against us can prosper. Amen. Amen Susan! Thank you so much for sharing about this. I was crying over the 21 last night. We have to take courage in the promises He has given us. We must be brave. God help us. I really appreciate the topic and the words of everyone. I have been struggling some these past 2 weeks and find everyone’s comment consoling. This is a beautiful post Susan. Fear is not from the Lord. Christians are martyred every single day, and this recent ISIS situation has merely shone a light on an exceptionally violent faction. I truly believe we who enjoy unprecedented religious freedom have become complacent and lazy, and the greatest tribute we can pay these souls is to WAKE UP. Melissa, yes – it is time to WAKE UP. God bless you, sister. Oh yes! I want to be “scared to life”! And to look to Him for assurance! Thank you for sharing! Love it! Let’s remind one another constantly, ok Barb? Powerful and timely indeed, my friend! Fear fights to win our focus, and overthrow our faith… but we must not let it! Susan, I was in the 6th grade, too, in Jax, FL. I remember drills where we were told to get under our desks. The state of the world and our country is cause for fear, but I choose to focus on G-d, who has promised to be with me. I also focus on listening to His voice because perilous times may cause believers to have to move quickly. I also believe in the rapture, but looking at history (and today’s news) I know we must use common sense to assess the dangers, as well as wisdom to make decisions. We are living at a very unique time in history – and we were born for such a time as this. Gail, amen to that. “We were born for such a time as this.” Yes, Lord. Love this post, Susan, especially today in light of recent murders of Christians. This quote resonates with me, “I am going to either be taken up to heaven by the rapture of Jesus Christ of His church OR, I am going to die on the day appointed to me. Either way, one way or the other, we are all going to leave this earth.” Such great Truth to live by…thank you! Amen! May we all be scared to life–to abundant life with God RIGHT NOW! There’s no need to wait :).